The Camp Fire is burning in the unfortunately named Paradise, a town in Butte County in Northern California. The fire has devastated the region, burning 148,000 acres, killing 71 people, and destroying 11,862 buildings. And it is only 55% contained. The Woolsey Fire, which is burning in L.A. and Ventura counties, has been slightly less damaging, burning 98,000 acres, killing 3 people, and destroying 700 buildings. 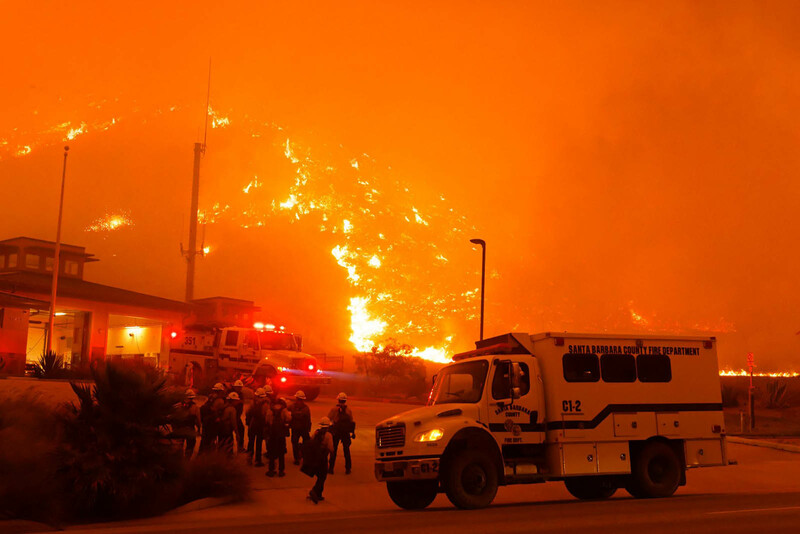 However, there are still about 57,000 people endangered by the Woolsey Fire. Governor-Elect Gavin Newsom, President Trump, and Governor Jerry Brown (L to R) have visited Paradise to assess the damage and express support for the victims. Trump said that the firefighters were “unbelievably brave”, and said “It’s going to work out well, but right now we want to take care of the people that are so badly hurt.” Governor Brown welcomed the President’s visit, saying that it is time to “pull together for the people of California”. Air quality across California has been unhealthy to hazardous, causing problems for populous regions such as the Bay Area and Southern California. People across the Bay Area have been buying face masks for protection, causing them to sell out at many locations. The fires have been so devastating that air quality in California is now the worst in the world, even exceeding pollution levels of Indian and Chinese cities. Numerous schools shut down in response to the air quality, including some universities, and San Francisco’s cable cars were shut down to encourage people to stay indoors. Imagine if you came from India and you travelled halfway around the world to visit SF only for the cable cars to shut down and be made to “stay indoors”. That would be the suckiest thing imaginable. Even at our San Francisco office, DC Blogs editors are feeling the effects of the overwhelming air pollution, including itchy, watery eyes, sore throats, and headaches. Air quality in San Francisco is bordering on the hazardous. Manmade Infrastructure: Huge numbers of people are moving to fire prone areas, and therefore many more houses are being constructed there. This creates greater opportunity for accidental manmade ignitions as more people begin living there. The need for power in these additional homes brings another huge problem – power lines. Power lines occasionally fall over, malfunction, or get disturbed, and when this happens, the sparks come in contact with the extremely flammable ground. Power lines were the culprit of 16 major fires in October 2017. Climate Change: As the global average temperature continues to climb, humanity will expect longer droughts and deadlier natural disasters. Humanity causes 84% of all wildfires, which proves that the name “wildfire” is a misnomer – they are generally manmade and not wild. So unless humanity is willing to change its behaviour, the fires are only expected to get worse. The scary thing about wildfires, and what makes them different from other natural disasters, is that anyone can start one. An individual person can’t start an earthquake, or a hurricane, or a tornado, but they can start a fire by way of mundane activities such as smoking, dragging sparks, or starting a campfire. So the first thing people need to do is to make sure they aren’t starting any open fires, whatsoever, under any circumstance. This year has been the deadliest wildfire season in the history of California. Let’s work together and make sure it doesn’t happen again.